Watch the Squeezed and Angry: How to Fix the Middle-Class Crisis session from the World Economic Forum's Annual Meeting 2017 here. The shrinking of the middle class and the widening gap between the ‘haves’ and ‘have nots’ in Western countries is often associated with the rise of populism. Alongside this decline, the middle classes have been growing in emerging markets as a result of globalised trade and market liberalisation, lifting millions of people out of poverty. 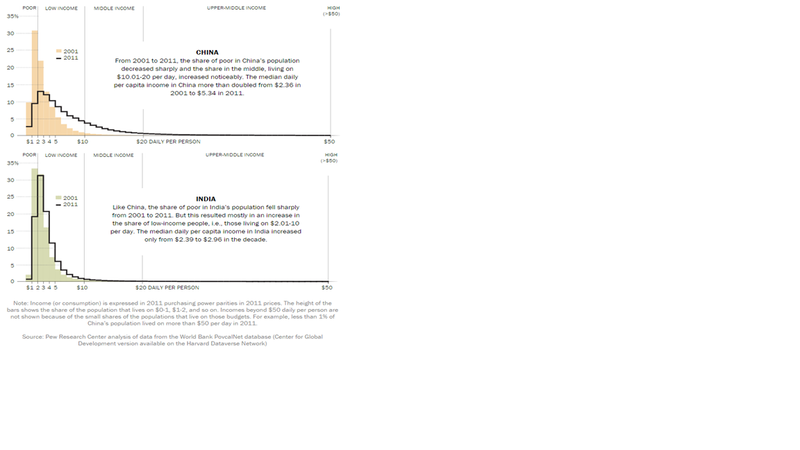 But even here, rates of progress are plateauing, raising questions for policy makers. So what is the state of the global middle class after the tumultuous year that was 2016? According to the Pew Research Center, America’s middle class reached a tipping point in early 2015 when it ceased to be in the majority after more than four decades. For the first time ever, there were more people in lower and upper income households combined (121.3 million) than among the middle classes (120.8 million). The number of households in the lower tier has remained fairly steady. However, those in the upper income bracket have increased by roughly the same percentage as the middle class has shrunk - by around a fifth between 1970 and 2014. 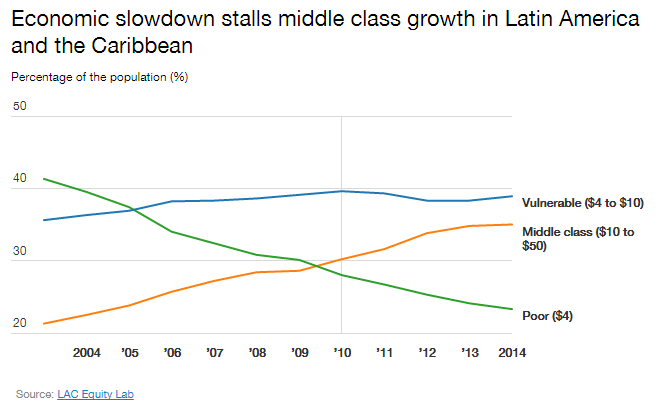 Why is middle-class growth in Latin America slowing? The trend is similar on the other side of the Atlantic. Based on a 2016 study by the European Commission and the International Labour Organisation (ILO), the financial and economic crisis has severely affected middle-income groups across Europe. 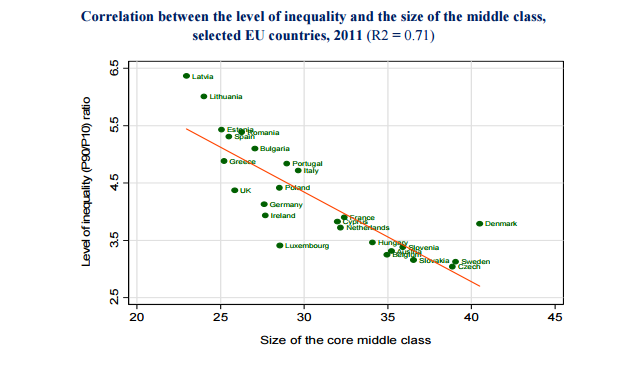 Almost all EU countries surveyed had seen a decrease in the size of their middle class and its share of income. This followed a steep increase in the size of Europe’s middle classes in the 1980s and '90s. The report also establishes a direct link between growing income inequality and the erosion of the middle-income tier in society. The economic slowdown has also brought middle class growth in Latin America and the Caribbean region to a grinding halt, according to the World Bank. Between 2013 and 2014, the number of middle income households grew by only 0.2%, signifying a virtual standstill. In the previous decade, the mid-tier population segment had experienced year-on-year growth of over 1%. Between 2002 and 2012, over 10 million Latin Americans had joined the ranks of the middle classes every year. Between 2013 and 2014 only 3.5 million managed to make the leap. On the positive side, poverty continued to decline throughout the decade. The problem is that, rather than progressing to middle incomes, the poor merely join the ranks of the ‘vulnerable’, living on between $4 and $10 a day. Between 2013 and 2014, this segment grew three times more than the middle class, turning it into the largest socioeconomic group in the region. However, the World Bank considers the vulnerable tier prone to falling (back) into poverty easily, making this trend a concern for the region’s growth and prosperity. In two of the largest Asian countries, India and China, poverty was reduced significantly over the period between 2001 and 2011, based on the most recent data from the World Bank. According to Pew Research, China was more successful at channelling its socioeconomic risers into its rapidly growing middle class. In India, the decline in the poor population was steeper but many of those escaping poverty did not step up to middle incomes. Much like in Latin America, the poor tended to move into the ‘vulnerable’ segment. As a result, 18% of China’s population are now middle class, as opposed to just 3% of people in India, according to this measure. Definitions of the middle class vary, though, with one study from economists at Mumbai university claiming that half the population in India can be defined as middle class. According to Pew research, only 12% of China’s population are considered poor, while a fifth of India’s populace still fall into this segment. In summary, then, the decline of the middle classes as the mainstay of economic activity and prosperity is a concerning global issue. The European Commission and the ILO argue that measures to protect the middle class must not stop at the world of work but also include areas such as education, social protection and taxation.